Workflow management software serves for basic process automation. Workflow software by Comindware is the first choice for those on the way from Excel or Outlook-based activity tracking towards a more system oriented approach. Workflow management software provides key capabilities for task, data and document management and is optimal for non-structured and quickly changing business processes. Classical BPMS focuses on process optimization as the next step to process automation. It allows not only modeling of sequences of tasks and capturing task related data, but also helps ensure all business processes are executed in the best possible way. Key capabilities include full process automation, activity monitoring, business analytics as well as enterprise system integration. Change the way you manage your business today. 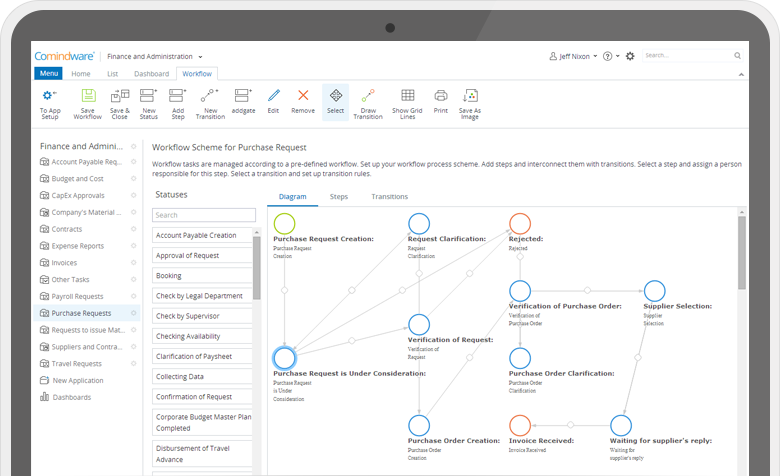 Comindware Business Application Platform enables creation of enterprise applications and solutions for all kinds of business needs – both for back and front office operations, such as Customer Order Management/CRM, Order to Cash and Request Management, ITSM, Partner and Supply Chain Management, Compliance and Policy Management and many others. More than just work management software.